The scalar energy pathogenic cleanse disassembles pathogens such as, viruses, bacteria, fungi, protozoan and prions. In specific, the scalar energy pathogenic cleanse negates the molecular bonds of the herpes simplex virus thereby serving to disassemble and eradicate this infectious agent from the human body. 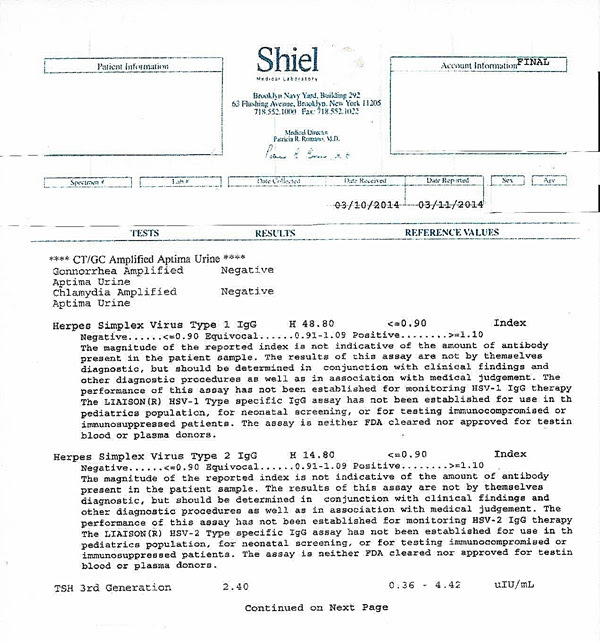 Below is an antibody test from an individual that was infected with the herpes simplex virus for over twenty (20) years. The diagnostic test reveals that antibodies are present for both herpes simplex virus I and herpes simplex virus II. This is an indication that this individual is infected with both herpes simplex virus I and herpes simplex virus II. After the diagnosis of herpes simplex viral infection, this individual was treated with the scalar energy pathogenic cleanse that served to disassemble and eradicate both herpes simplex virus I and herpes simplex virus II from their body. In order to prove that the scalar energy pathogenic cleanse successfully disassembled the herpes simplex virus, PCR tests were conducted in order to ascertain the viral load of the infectious agent. A polymerase chain reaction (PCR) test is a diagnostic test commonly used to ascertain the genetic presence or absence of a pathogen, such as the herpes simplex virus, found inside the human body. Succinctly, a PCR test is able to detect either the presence or absence of the DNA of the herpes simplex virus and is considered an accurate diagnostic test by the medical community. 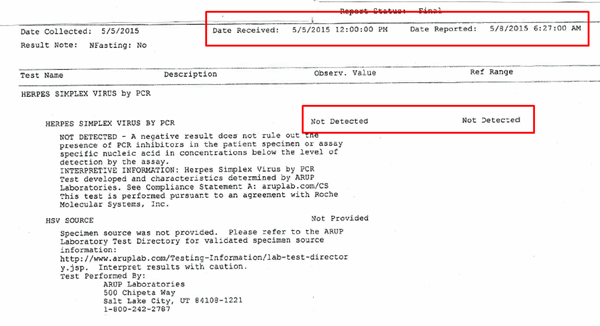 A PCR test that is unable to detect any amount of DNA of the herpes virus will render a result: "Not Detected"
Two (2) consecutive PCR tests were conducted after the scalar energy pathogenic cleanse was administered. Below are the two (2) consecutive PCR tests of the individual that was clinically diagnosed with herpes simplex viral infection for over twenty (20) years. The scalar energy pathogenic cleanse effectively disassembled and eradicated the herpes simplex virus. Today, this person is cured from herpes simplex viral infection as there is no viral load to be detected. 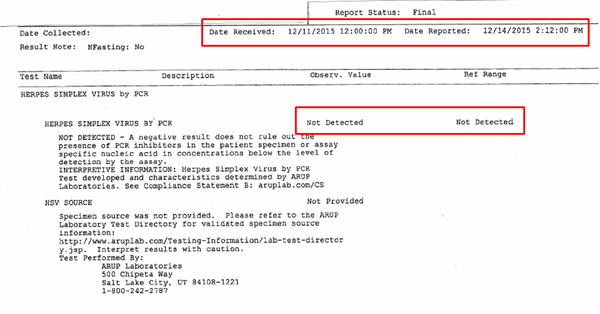 Both PCR test results are: "Not Detected"
The initial PCR test was conducted on May 5, 2015 and the subsequent PCR test was conducted on December 11, 2015. The back-to-back PCR test results prove that scalar energy has negated the molecular structure of the herpes simplex virus thereby disassembling the virus into smaller, harmless, physical forms. In so doing, the herpes simplex virus has ceased to exist. Scalar energy is a primal force in nature that serves to assemble and maintain the molecular structure of all physical forms in the universe, including the herpes virus. Conversely, scalar energy can be controlled to negate the molecular forces that assemble and maintain the molecular structure of all physical forms in the universe, including the herpes simplex virus. In practice, I have developed the scalar energy pathogenic cleanse that serves to negate the molecular forces that assemble and maintain pathogens, such as the herpes simplex virus. As a result, the herpes simplex virus will disassemble and cease to exist. In conclusion, the scalar energy pathogenic cleanse is capable of negating the molecular structure of pathogens such as viruses, bacteria, fungi, protozoan and prions. In so doing, pathogens are disassembled and cease to exist. PCR tests have been conducted subsequent to the scalar energy pathogenic cleanse in order to detect the presence or absence of a pathogen. Invariably, all PCR tests that have been administered eventually prove an absence of the pathogen that once infected an individual. Without exception, all PCR test results have confirmed the efficacy of the scalar energy pathogenic cleanse to disassemble and eradicate pathogens from the human body. Ultimately, one day the scalar energy pathogenic cleanse will be embraced as the cure for all pathogenic infection. ​Life-Changing Healing Powers of Scalar Energy Healing. ​Tom Paladino is a scalar energy researcher that has developed scalar energy instruments that are capable of controlling and subsequently negating the molecular bonds of germs, such as, viruses, bacteria, fungi and parasites. This simple and painless process utilizes natural scalar light to break down the molecular bonds that hold together germs. As a result, the germ breaks apart and no longer poses a threat to human health.